We are gearing up for the biggest shopping weeks of the year and we know you are, too! Don’t forget to check out all our Disney Gift Guides if you’re still looking for that perfect gift! Plus, we’ve got a brand new crop of Disney How To Guides to help you plan parties and other fabulousness! 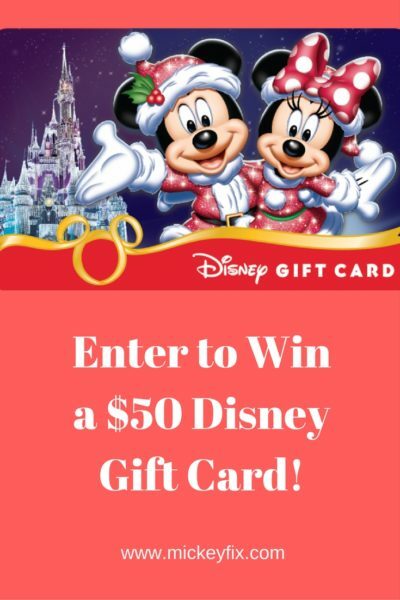 We giving away another $50 Disney Gift Card to one lucky Mickey Fixer so they can have a little boost to their holiday budget! The giveaway will end on November 10th, 2017 at 11:59 pm. The prize will be provided by Mickey Fix. We will confirm that you are a subscriber of the Mickey Fix newsletter. Mickey Fix is not affiliated with the Walt Disney Company or its subsidiaries. United States only. I subscribed today. So excited , I just love anything Disney. Already mad3 lunch reservations at the Blue Bayou for Christmas Eve lunch. Already a subscriber! Love following on FB as well! Checked out Facebook page already liked! Already a facebook follower! Love Mickey Fix! I’m already a subscriber and follow you on FB – thanks for the giveaway!! Already follow Mickey Fix on Facebook. Yay! Fingers crossed! I’m already a subscriber 🙂 thank you! Yay! I’m also a Facebook subscriber! 🙂 thank you! I visited on Facebook and like your page. Already subscribed to the newsletter and follow you on Facebook. Subscribed to both!! Can’t wait to go for our Christmas vacation!! Already subscribed to both the newsletter & Facebook group! Christmas at Disney is the best! Great web site!! Lots of wonderful information!! I subscribe to all things about Mickey Fix!! already follow on FB and visited! Already a subscriber and FB follower. Already subscribed, and now entered to win! Just visited your Facebook page for an extra entry! Also, I follow you on Facebook. Visited Facebook page. I already follow. Also already follow on FB! Already follow on Twitter! Thanks for the chance! I just visited Mickey Fix on Facebook (and I already liked and followed Mickey Fix on Facebook). I already follow Mickey Fix on Twitter. Already a subscriber! Ready for the Christmas season! Visited and liked the Mickey Fix facebook page and post! Subscribed! I love this site! Subscribed to the newsletter and already follow on facebook! I am a subscriber and I follow on Facebook. Visited the facebook page and follow it. I subscribed to the newsletter and to the Facebook pages! Double entry!! Already subscribed! Thanks so much!!!! Already subscribed everywhere! thank you!!!!! I looked at your Facebook posts. Thanks! Already a subscriber and follower! I follow you on Facebook and I’m already a subscriber of the Mickey Fix Newsletter! I would love to win! Already a subscriber & also visited Facebook page!! Would love to win! I’ve already liked the Facebook page, but I did visit again! this is so exciting, my granddaughters and I LOVE anything DISNEY! Already a subscriber and liked on Facebook. Subscribed and commenting for my entry! Also follow MickeyFix on facebook. Extra entry for my visit to your Facebook page! Extra extra entry for following you on Twitter! Already subscribed and visited the Facebook page. I’m subscribed to the newsletter and visited (and liked) Facebook. I visit you Facebook almost every day!! Already subscribed and loving it. I visited you on Facebook! Always enjoy getting disney news. Signed up and now heading to fb. I am a Mickey Fix Newsletter subscriber. Subscribed! Love this site and Disney!! I visited mickey fix on facebook. Already follow Mickey Fix on facebook!! Subscribed, liked on Facebook. Can’t wait till our trip there next year! I just subscribed to the newsletter! I’m already subscribed to your email!!! I follow you on facebook and on twitter!!!! Subscribed to newsletter! Can hardly wait to get my first one. Thanks for the chance to win a gift card. It would be perfect for our upcoming trip! Visited and following on Facebook. Thanks again for a chance to win! Already subscribe to your newsletter! Wish I was at WDW right now!! Already a subscriber to the newsletter!!! Loving it!! Signed up! Can’t believe I haven’t already done that! I hope we win. We’ll use iit for our trip in April! I get the newsletter and follow on facebook! I follow Mickey Fix on Facebook! Done – please pick us! Thanks! I like and follow you on Facebook. Subscribed to the newsletter! Thank you for the opportunity! Subscribed. Thank you for this generous chance! I’m subscribed. Thanks for the giveaway! Liked and follow on Facebook! Already a subscriber. Would love this for our trip in January! Also a follower on Facebook. Love seeing your “tweets” on Twitter! Already a subscriber and loving it! I just signed up and confirmed, thanks for the opportunity to perhap win a $50.00 gift card, we all could use that. Merry Christmas to everyone! Already subscribe and follow on Facebook! Subscribed & following! Thank you! I’m a subscriber and already follow on Facebook! I already enjoy your page on facebook.